Why do people get Liver Pain? The liver plays two very important roles; number one is that it converts food into nutrients delivering everything your body needs in order for it to properly function. Secondly the liver is also works hard to flush out waste and detoxify. So if you ever feel similar type of pain coming from your liver, then it’s a signal from your liver that there’s something that’s seriously wrong that needs your attention ASAP. If your liver does happen to be affected by a disease or is simply being overworked and overloaded, if you leave it untreated then it can't convert food nutrients properly nor can it detoxify and flush out waste which can cause more serious liver problems. As liver problems become more and more common, statistics now show that at least 1 out of every 10 persons have a liver problem. Consuming too much alcohol, Hepatitis C, non-alcoholic fatty liver disease, cirrhosis and liver cancer are now some of the most common causes of liver problems. Its also important to know that sometimes pain felt in and around the same area of the liver can be something else entirely such as a problem with the pancreas, the gallbladder or even the kidneys. If you are experiencing liver pain, you may be tempted to take a quick pain-killer. Don’t do this if you haven't already... This is because the liver’s job is to filter out toxins, and taking pain killers will only tax your liver further and can end up hurting your liver even more and make the condition worse. Avoid eating fatty / greasy unhealthy foods at least for a week. When you sit, make sure to sit-up with your back straight this will ensure no unnecessary pressure is being applied to your liver. Try our bestselling formula Liv-Re-Gen which has helped hundreds of people experiencing Liver pain, each capsule is jam packed with ingredients your liver will love and more importantly zero fillers have been used. Fillers are what are binds ingredients together, fillers are used in medications such as pain killers, processing fillers by the Liver is what gives the liver extra work to do in order to filter out toxins, this is another reason why you should avoid taking pain killers when experiencing any form of liver pain. Drinking water is good, but mixing water with our organic product Maximum Recovery is even better. 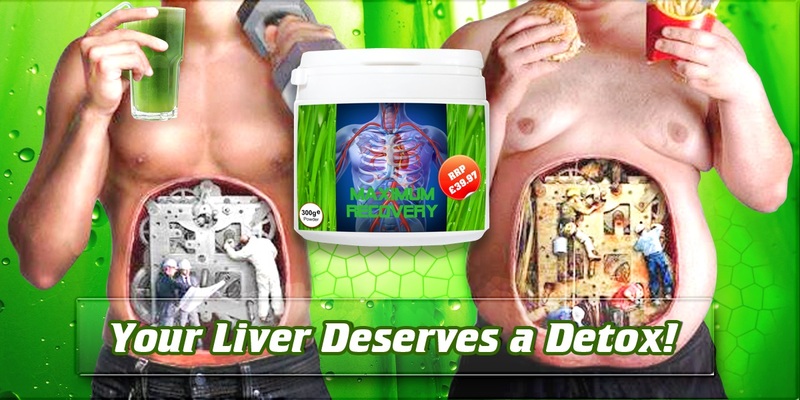 As it contains 35 beneficial ingredients for your Liver in each and every scoop. Just add a few scoops to a bottle of water and drink throughout the day, takes less than 30 seconds to prepare with no mess, no fuss and no hassle. Click here for the list of 35 foods that are good for the liver and also contained within each and every scoop of Maximum Recovery.